All men welcome! Come join a good bunch of guys at Mars Hill. We meet each Saturday at 8:00am and Tuesday at 7:00pm in the Fellowship Hall - except on Breakfast Saturdays. Sometimes we have special events. Sometimes we join together as a "Fix-it Club" to help people in the need with odd jobs at their homes. We want to become more spiritually mature, serve our church and community, and help bring other men to a fuller knowledge of Christ Jesus. Our new Bible Study will start Saturday, April 27th at 8am, and Tuesday April 30th at 7pm. Join us Saturdays at 8am, or Tuesdays at 7pm each week. For more information please contact Luther Hudson at elutherhudson@gmail.com. The Men's Breakfast provides a casual atmosphere for food, fellowship, inspiration and service. Men and boys of all ages are invited. 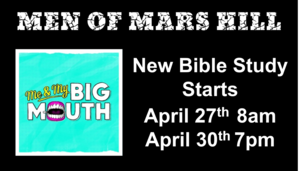 This is a great time for our newer members and church guests to get to know Mars Hill. So whether you are a church member, a member of the local community, a guest of someone in the community, or just passing thru, come join us for breakfast! For more information contact Luther Hudson at elutherhudson@bellsouth.net.